The chunk of time between sixth form and college was tough for me. I didn't get the grades I needed for university, so I had to stay behind while a lot of my friends, the best and brightest of my year, went off to study. My girlfriend was one of those that left. She went to Cambridge, and she found someone else. Someone who was, you know, there. I read the Dear Rob letter on a busy Victoria Line train into work. I burst into tears in a packed tube carriage. Like I said, tough times. Family life was equally interesting. Mum and Dad had split up while I was studying for 'A' Levels, and as I studied for retakes, I realised I needed to take some time away from the tumult of life with my mum and brothers. I had become one of those sensitive teenagers who wrote poetry and moped constantly. With a broken family home and my romantic life in tatters, I suffered as no young man ever had before or would after. Dad, at the time, was living in a small house in Wanstead, and I moved in over that summer of 1985 to get my head together and sort out enough of an improvement in my grades to get the heck out of Essex. It was a peaceful time. I looked after Dad's shop (he was even good enough to call me the manager) to earn my rent and a little beer money, wrote and studied. And Dad started to teach me how to cook. It was, he said, an essential skill for when I set off on my own. Also, he'd had to bloody learn when mum kicked him out, so he was going to pass the pain on. 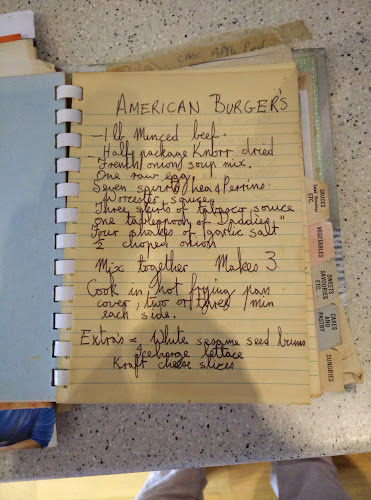 He had a limited repertoire, gleaned mostly from the two cookbooks on his shelf, but one treat was always his American Burgers, a recipe he'd found in a newspaper and carefully noted down in his round, solid cursive. Common knowledge now is that burgers are at their best treated simply, with care taken as to the mix of fatty and lean meat used. Back then, Dad used what he had, knowing that the flavours and spices that went into the burger would give it the right taste. They became a weekly treat for us, one that we would often cook together, with the tape player blasting out Bruce Springsteen. The other week, TLC and I drove up to Essex to visit the 'rents. Time has been kind. Mum and Dad got back together during my first year at college, buying a new house and making things right with each other. I had done enough to get a place at the Dorset Institute Of Higher Education (now Bournemouth University) and packed my bags for the south coast in the autumn of 1986. In one of those bags was the notebook in which I had cribbed my favourite recipes from my time with Dad. The American Burger was in there, of course. It was a connection to home, and to a peaceful, healing time. Dad doesn't cook very often anymore, but when he does the grub is always good. We had a sort of indoor barbecue on the Saturday night, and he pulled out the big guns. The American Burger was on the menu. He still has the notebook in which he wrote the recipe, stained and brown from decades of use. The Burger tasted just as delicious as it always had. I had no Proustian moment connecting me to the tumultuous past, no great epiphany. But I have fond memories of cooking with my Dad in that summer, as he and Mum gently negotiated a truce, then the rebudding of a romance. I'd like to share that recipe–as best I can, anyway. You can't get the Knorr onion soup mix it recommends any more, so you'll have to manage with what you can find. Dad uses an Ainsley Harriott mix, if that's any help. If you do have a fatty mince blend, then you can probably get away without the egg. But try it as is, just to give you an idea of the flavours of my bumpy adolescence. Cook in hot frying pan, cover, 2-3 minutes each side. Next Next post: The August Soundtrack Special!